Photos can be great resources for further understanding and applying linear perspective. The presentation above gives a step-by-step look at how a photo reveals depth much like that used in linear perspective. When there is a single vanishing point, all convergence lines appear to recede to a single point. The convergence lines represent parallel planes that look like they get smaller as they get further from the viewer. You'll notice that, besides the diagonal convergence lines, there are mostly only vertical and horizonal lines present. Photographs of Architecture-are good resources for seeing perspective because most cameras rely on a single lens making the receding lines more predictable. We see stereoscopically (with two eye lenses) so the recession may be harder to predict. Try using a photographic print of a four-walled rectangular building and draw the horizon line, vanishing point, and convergences on the copy. An architectural photograph that displays the properties of one-point perspective is the Rue de Meaux Housing Complex by Renzo Piano built from 1988-1991. This phtograph has very well defined convergences created by the brightly colored concrete and brick walls. Even the walkway gives a sense of recession in this photo. If you draw lines aligned with the bricks and extend to the center of the photo they should all converge at the vanishing point. 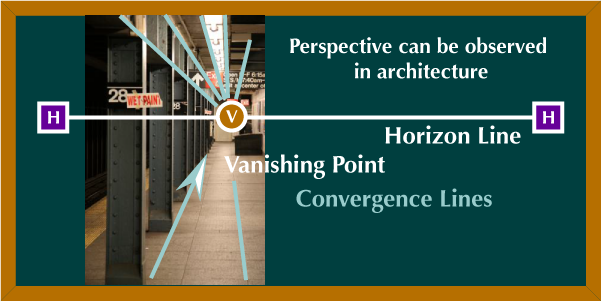 The vanishing point is always on the horizon line. Gateways to Art by Debra J DeWitte, Ralph M Larmann, and M Kathryn Shields is designed for anyone who wants a strong fundamental knowledge of art.